Why Can't PR Do Digital? Why Can’t PR Do Digital? Why aren’t PR firms offering digital marketing services to their clients? On Sunday, David Anderson from Off Madison Ave and I presented this roundtable at the PRSA Counselor’s Academy conference in Palm Desert. 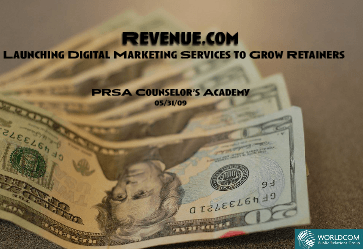 The title is: Revenue.com: Launching Digital Marketing Services to Grow Retainers. Note we only had ~30 minutes, so this isn’t as comprehensive as I’d prefer. View more Microsoft Word documents from Jason Baer. Brands are embracing social media. 63% of global best-in-class companies will increase social media spending in 2009. Most digital services are ongoing, retainer-based programs. Digital services are inherently measurable, making it easier to prove PR firm value. Digital is ever-changing. There’s always a new wrinkle – always something new to sell. Search engine optimization. Fundamentally linked to modern public relations (or should be). Social media. Listening programs. Engagement and messaging counsel. Social media crisis management. Digital content creation. Blogs. Facebook pages. Podcasts. Videos. eBooks. Helping clients atomize content effectively (see this post from Todd Defren for more info). Matrix client opportunities. Is the client engaged in SEO, social media, etc. already? In-house? With another agency? Index staff competency. Probably, your existing staff aren’t SEO or social media “experts.” But, are there team members with interest + aptitude? Put your aces in their places. Assign vertical expertise. Don’t try to make an all-knowing digital superstar in your agency. It’s high risk, and it doesn’t scale. Divide expertise throughout the team. 1-2 people per discipline. Train. Find someone reputable to provide serious social media training, SEO training, digital content training. Practice on yourself. Eat your own dog food. Get good at SEO, social media, and digital content on behalf of your own agency. Sell to clients through education. It’s easier to sell digital services in a seminar, rather than a “pitch.” Start scheduling regular education sessions for your clients, and they’ll end up “pitching” themselves.